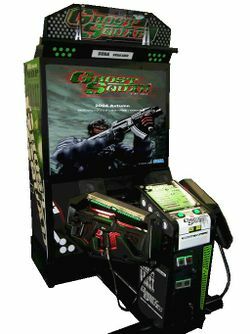 Ghost Squad is a light gun rail shooter arcade game developed and published by Sega for the Chihiro board. A home version has been developed for Nintendo's Wii game console. Ghost Squad is basically a Time Crisis spinoff of a special squad dealing with terrorism in a fictional shooting game. The most unique part for the Wii is the practice mode without the reticle, party mode for up to four people and the three part story mode. What's special with the three part story mode is the branching storyline, with a boss at the end of each part of the story. This game is compatible with the Wii Zapper. US and PAL region Wii cover. This page was last edited on 30 November 2009, at 05:25.